Transform your sad, but healthy desk salad into something you're excited to eat with these expert tips. In effort to save money and control what I put in my body every day, I try to brown-bag as many meals as I can. As I’m often too busy to cook anything other than dinner during the work week, I instead stock up on premade salads at the grocery store in hopes of adhering to some kind of healthful regimen. Though, according to research cited in Time, eating the same thing day-after-day has been proven to help with diet adherence and weight loss, it can also get super boring after a while. If you’re anything like me and are desperate to break the monotony of premade salads or ingredients thrown together in Tupperware, you’ll be excited that Rachel Berman, R.D. 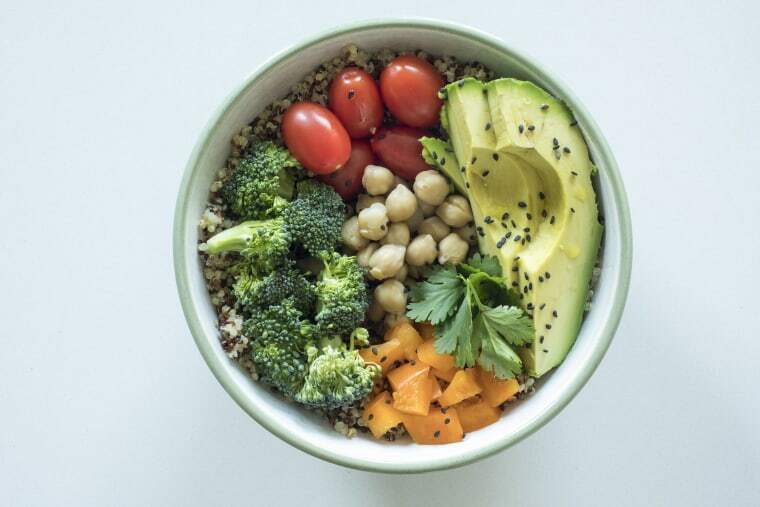 and general manager at Verywell, and Ariane Hundt, clinical nutritionist, kindly shared gathered their suggestions for healthful salad additions to keep our taste buds better entertained. Berman says chia seeds can add a little zest and crunch when added to a salad. Plus, it’s good for you. “One tablespoon of chia seeds adds 5 grams of fiber and a dose of omega-3 fatty acids to your salad,” she says. Omega-3s are good for cognitive function, reduce inflammation and may help lower risk of chronic diseases such as heart disease, cancer and arthritis. Who doesn’t like a little crunch? Berman says, aside from adding color and texture to your salad, red cabbage is also an additional source of vitamin C, which has been found to strengthen the immune system on a cellular level. Hundt says sprinklingsprouts and other “young” plants, like watercress and mung beans on your salad can fortify them with more concentrated nutrients than mature plants. “They’re chock-full of enzymes crucial for every function your body performs,” she says. Plus, watercress tops the list of nutrient-dense fruits and vegetables that help prevent chronic disease, according to the Center of Disease Control. Berman says cannellini beans don’t only taste great, but they add a boost of fiber and protein to your salad, making it more filling. “I particularly like cannellini because they tend to be meatier than other beans and that consistency can help keep you satisfied,” she says. Hundt extolls mushrooms for their immunity strengthening properties and their potential to suppress the invasiveness of breast cancer cells, as shown in some studies. Plus, they're full of vitamins C, D and B, and selenium — an antioxidant that works to prevent heart disease and cancer. “If you are into a meatier taste, go for reishi, maitake and shiitake mushrooms,” she says. An easy source of protein, eggs are a rare source of vitamin D, which can help keep your bones strong and help you fend off depression during the long winter months, says Berman. Aside from adding a little warm weather charm to your salad, Hundt says avocados are a terrific source of potassium (more than a banana) and “good” fat (meaning monounsaturated fats, which promote heart health). Plus, they are carb-free and are loaded with fiber, to make any skimpy salad feel filling. Berman says adding some roasted butternut squash or sweet potato to your salad can also make you feel like you’ve had some serious sustenance. “They’re both a great source of the antioxidant vitamin A, which keeps your eyes and skin healthy and helps ward off infections,” says Berman. Aside from adding a little zoom to your salad, fermented foods have long proven to strengthen the digestive tract. “This translates into more regular digestion, reduction of gas and bloating and a boost in your immune strength,” says Hundt. Made of bread and cut up, fried wonton wrappers (essentially), Hundt says these crunchy additions add nothing but empty carbs that’ll only spike your blood sugar and make you hungry again sooner rather than later. Sure, dried fruits can really add a nice sweetness to a premade salad, but they’re also filled with more sugar than fresh fruit, leading you back to a blood sugar spike and crash, says Hundt. Cut up an apple or peel an orange to add to your salad instead.